Samsung will produce Snapdragon 820 Processor. Samsung, the South Korean Electronics giant has announced that it will be producing the chips in the upcoming Snapdragon 820 processor. To make it more informative, Samsung has added that the Snapdragon 820 goes through the same 14-nanometre manufacturing process which Samsung currently uses while manufacturing Exynos chips. Though the Snapdragon 810 has been one of the most used processor for high-end devices, but it has ruined a lot of flagship devices because of the heating issues. Although, the latest Snapdragon 810-v2.1 has solved a lot of problems that came with the older Snapdragon 810 version, It seems that Snapdragon 820 will take over all the problems faced by the Snapdragon 810 and give the best performance. It has been seen that, the Octa core Exynos Processors manufactured by Samsung have performed really well on the high-end devices like – Galaxy S6 & Galaxy Note 5. A lot of upcoming high-end smartphones are planned to have the Snapdragon 820 Processor. We previously posted about Galaxy S7 coming with Snapdragon 820 chipsets. Here is an image which shows the comparison between the Old Snapdragon 810 vs New Snapdragon 810 vs Snapdragon 820, which shows a lot of performance difference between the Snapdragon 810 and the Snapdragon 820. 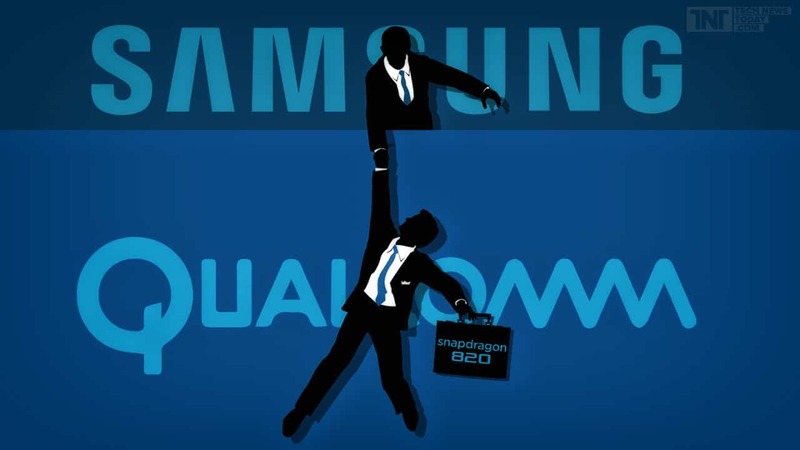 This news also confirms the previous rumor about the Galaxy S7 coming with the Snapdragon 820 chipset. Few days back, Hugo Barra, VP at Xiaomi Global tweeted about the Xiaomi Mi5 having the Snapdragon 820 in it, We also talked about Symetium, a High-end beast which will come with Snapdragon 820. GSMArena posted about Snapdragon 820 being exclusively available to Samsung till April 2016, which also concludes that all the devices which are planned to have Snapdragon 820 will be launched after April 2016, so if you are someone who is planning to buy a Phone which will have the Snapdragon 820, then the wait can be long!